New Delhi: The Congress party on Monday appeared set to form the next government in Rajasthan after it emerged as the largest party in the 200-member legislative assembly, winning 96 seats, just five short of a simple majority. While the Congress gained 40 seats over its 2003 tally, the BJP lost on 43. Among the smaller parties, the Communist Party of India-Marxist (CPM), and the Bahujan Samaj Party (BSP) tripled their tally—CPM score went up from one to three and BSP from two to six. 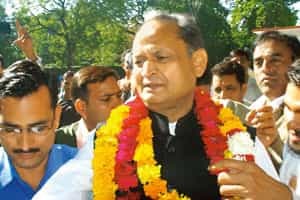 The Congress had not named its chief ministerial candidate during the election campaign although former chief minister Ashok Gehlot and president of the party’s state unit C.P. Joshi were considered the frontrunners. But Joshi’s luck ran out on Monday when he lost his Nathdwara seat by just one vote. “This is because of the hard work of our party members. We were always expecting such a mandate," said Joshi. Local issues took precedence over larger national issues, such as terrorism and economic slowdown. The state went to the polls on 4 December, after the 26 November Mumbai terror attack. While terror was a non-issue in rural Rajasthan, even urban areas seem to have laid more emphasis on local problems like water shortage, corruption and illiteracy. While the BJP’s campaign rested mainly on the development plank, analysts say Raje’s constant criticism of the Congress-led United Progressive Alliance government at the Centre, instead of concentrating on her party’s achievements, cost her the state. Raje’s hubris and larger-than-life persona also cost her heavily. “In Rajasthan, one widely held perception was that she (Vasundhara Raje) was running amongst the most personalized, if not corrupt, administrations in the history of the state," said Pratap Bhanu Mehta, president, Centre for Policy Research, a Delhi-based think tank. “The electorate does not react favourably to an extraordinary personal projection. Further, there was a lot of internal infighting she had to overcome," he said. Despite initial bickering and infighting within the party over distribution of tickets, the Congress seems to have dealt with internal friction better than the BJP, which by its own admission, was routed because of intra-party strife. “Had we been able to tackle our internal differences and put our house in order, things would have been different. It is a narrow margin defeat," said Arun Jaitley, a general secretary of BJP. “There was a strong anti-incumbency wave against Raje," said a senior BJP leader who didn’t want to be named. Her already dim prospects of returning to power had been darkened by internal squabbling that pit Raje against factions led by former Union minister Jaswant Singh and former vice-president Bhairon Singh Shekhawat, this person said, adding that Raje didn’t even have the backing of the Hindu nationalist Rashtriya Swayamsevak Sangh. “Of all the problems in ticket distribution, the maximum number of complaints have been from Rajasthan," he added. “Even the Brahmin leaders were angry with the party. There was no coordination between the party and the CM (chief minister)." The electoral verdict in Rajasthan, known for its caste complexities, was also expected to be more fractured with smaller parties such as the BSP and the CPM hoping to make serious inroads. However, with only six seats, the BSP is unlikely to play any key role in the formation of the next government. Further, the BSP’s gains have not really caused much damage to the Congress, as was widely expected, but the party ate into the BJP vote share to an extent because of the intricate caste equations. “The momentum behind the BSP is certainly not as big as we thought, but is still fairly significant," said Mehta of Centre for Policy Research.